Floating solar panels utilize the same technology as the panels that you put on your roof. The main difference is that they’ve been adapted to fit onto floating platforms, which are designed to be placed on lakes and quarries. While the technology still hasn’t evolved the point where it can be used on the open ocean, however, we could see more use of floating solar panels on the water in future. 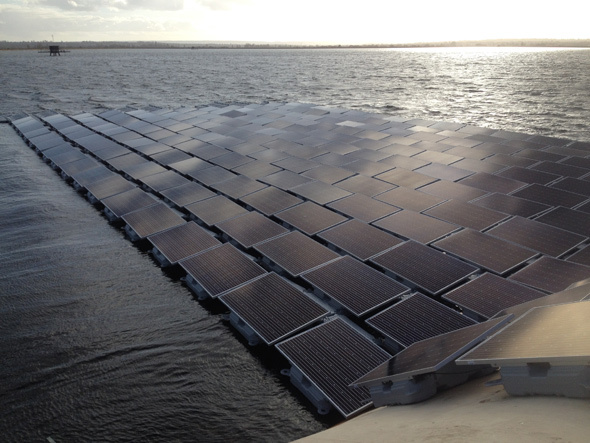 The floating solar panels are a great new technology that’s promising to change the way we look at renewable energy. Eight football pitches worth of photovoltaic (PV) panels being installed now on a reservoir near London will generate enough energy to power 1,800 homes a year! 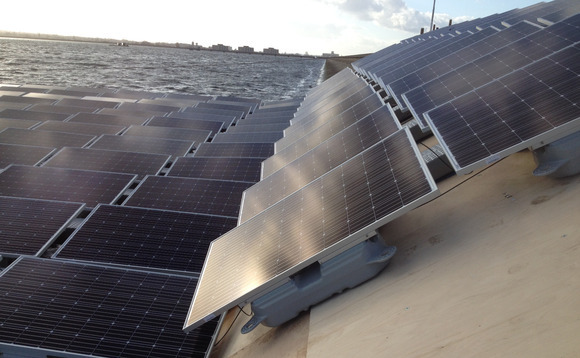 The project is undertaken by the utility company Thames Water is the latest to lay claim to being Europe’s biggest ever floating solar panel array, and is part of the private firm’s bid to generate a third of its own energy by 2020. Thames Water is striving to become more energy efficient to reduce its reliance on energy from the grid. It generated a total of 12.5% of its electricity requirements from renewable sources in 2014/2015, which is a 4% increase on the year before. In 2015, Thames Water pledged to support the objectives of the Paris Agreement to limit the global temperature rise to less than 2 degrees Celsius and this project will contribute to achieving this goal. Floating array on reservoir near London will be the second-largest in the world once completed in March. More than 23,000 panels will be floated on the reservoir, providing enough electricity each year to power the equivalent of around 1,800 homes. Due for completion at the end of March, the finished array will cover around a 10th of the reservoir's surface - the same area as eight Wembley-sized football pitches. The renewable electricity produced by the 6.3MW array will power a nearby water treatment centre, Thames Water said. "Becoming a more sustainable business is integral to our long term strategy and this innovative new project brings us one step closer to achieving our goal - this is the right thing for our customers, the right thing for our stakeholders and most importantly the right thing for the environment," energy manager Angus Berry said in a statement. Solar energy company Lightsource is managing the installation, which will require more than 61,000 floats and 177 anchors to keep the array above water. Lightsource chief executive Nick Boyle said that as more industries look to decarbonize, the solar industry will need to develop new skills to ensure projects deliver maximum efficiency. "There is a great need from energy intensive industries to reduce their carbon footprint, as well as the amount they are spending on electricity and solar can be the perfect solution," he said in a statement. "We're therefore constantly evolving new skill sets to ensure that all of our projects deliver maximum energy generation over the lifetime of the installation." Floating solar farms are considered an efficient way to maximize renewable energy generation in areas where land is scarce, by using the normally redundant surface area on reservoirs and lakes. The largest floating solar array is currently under construction on a reservoir in Japan. Once completed, it will provide enough clean electricity to power nearly 5,000 households. Advocates of the approach argue it can also reduce evaporation from reservoirs, while the cooling effect of the water is said to help improve output from solar PV cells, as reported by Business Green.